Dr. John Williams is a Connecticut native. He attended college at the University of California at Davis (UC Davis) where he earned his Bachelor of Science and Masters in Animal Nutrition and his Doctorate of Veterinary Medicine. His Masters research investigated the nutritional requirements of kittens. He and his wife Dr. Marti "joined forces" while studying veterinary medicine at the University of California at Davis, a college consistently ranked as one of the top veterinary school in the country by U.S. News and World Report. Their meeting was facilitated by the fact that their names followed one another in the alphabet; hence they met as lab partners. They were married soon after graduating veterinary school in 1987 and soon, with Mikey the Cat, Mindy the Giant Schnauzer and Cassie the Golden Retriever, were jointly operating a small animal practice near Palm Springs, California. In 1999, after ten years of success in operating their own practice, and the arrival their children James and Katie, they relocated to Hockessin, Delaware. Accompanying them in Delaware are Stella, a Papillon and Gabby, a Giant Schnauzer. They also have two orange tabby cats named Simon and Patrick. 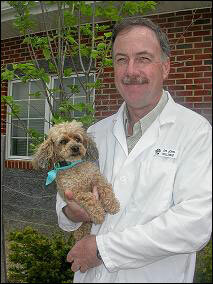 In concert with Dr. Marti, he holds high quality veterinary medicine to be the first and foremost goal in practice. John is a Certified Canine Rehabilitation Therapist (CCRT), a specialty similar to a Physical Therapist in humans, providing treatment to individuals to develop, maintain and restore maximum movement and function throughout life. In addition to his family and pets, John enjoys home re-modeling (a necessity living in a 65 year old home!) landscaping, motorcycle riding, and boating. Working close to home with James, Katie, Stella, Ariel, Simon, and Patrick never too far away, both doctors strive to maintain a close-knit family oriented practice.